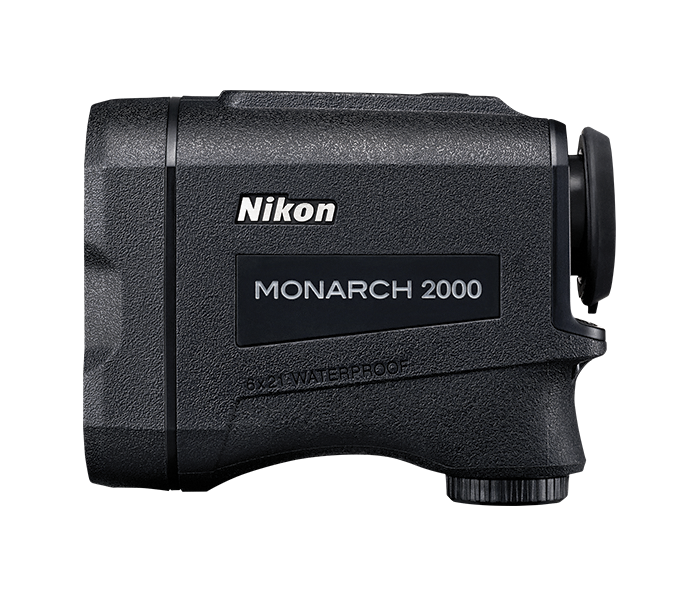 The all-new MONARCH 2000 6x21 Laser Rangefinder brings Nikon’s advanced laser rangefinder technologies and a 8-2,000 yard* measurement range to the long-range hunter. With 1/2-yard precision** displayed in 0.1-yard increments, Tru-Target™ Priority System and Nikon’s ID (Incline/Decline) Technology, MONARCH 2000 is up to any hunting or shooting endeavor—whether bowhunting from a tree stand or executing incredibly long range shots. Waterproof/fogproof. *Under Nikon’s measurement conditions and reference value. **Under Nikon’s measurement conditions. The specifications of the product may not be achieved depending on the target object’s shape, surface texture and nature, and/or weather conditions. Nikon’s advanced ID [Incline/Decline] Technology provides the horizontal distance to the target, even when ranging at various incline or decline shooting angles—up to an incredible +/- 89 degrees [nearly vertical up or down]. O-ring sealed to prevent moisture from entering body. Purged using nitrogen gas for total reliability against thermal shock and internal fogging.